As many of you probably already know, Think Secret has taken a very brave move by predicting a ‘Real Video iPod’ to come out around Apple’s 30th Anniversary. They believe the iPod to sport a 3.5″ widescreen, along with a touch-weel (a touch-sensitive click wheel on the screen). They have beliefs that the 5G iPod was not really the “Video iPod” that everyone was anticipating for. Apple has made clear that they do not want the 5G iPod to be called a Video iPod, because its main purpose is still the music. Think Secret was not the only one to believe that the 5G iPod was really the Video iPod. 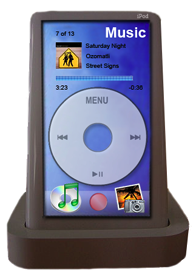 I have had feelings toward the 5G iPod that it just wasn’t really the Video iPod that Apple has been working on. Ever since the 5G iPod was released, I thought to myself that this couldn’t be the ‘Real Video iPod’, more like an iPod that had video-capabilities. Think Secret does not think that the new iPod will feature wireless capabilities, but some believe that Apple could use some of its patents concerning the touch-screen and motion-sensing interface in the new iPod. I am going to be backing up Think Secret on this one, and it would make perfect sense for Apple to announce the 6G widescreen iPod on their 30th anniversary. I also believe that they could announce a new Intel iBook and an Intel Mac Mini. But if this rumor does come true, I can see it challenging Sony’s PSP for a battle of the portable media-center.